Ginisology: Treasure Chest Thursday, Email Inbox Treasure! 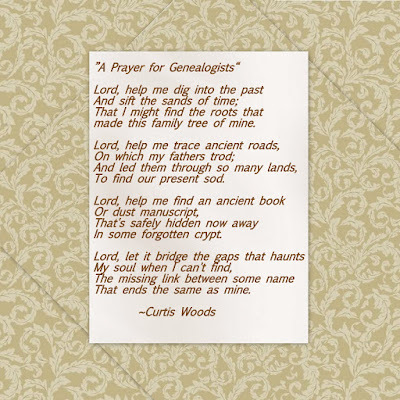 My dear genealogy friend Rachel had sent me a ton of genealogy quotes and poems last year via email. I met Rachel thru Ancestry.com's message board when I had very first started my own family history. Rachel helped me more than I can ever express in just saying thank you. She has been doing genealogy for many years and both of our ancestors hail from Kentucky. We had discussed our love for poems and quotes related to genealogy and family history. Next thing I knew, she had sent over a ton of them. I have a treasure chest full to share, some you may have already read, some not, but they really are wonderful. This isn't your typical Treasure Chest Thursday post, but it does mean alot to me. This family tree of mine. That ends the same as mine. Source: Rachel my friend, thank you. Thanks for sharing. Would you mind if I copy and send to a few friends of mine who love genealogy? Thanks for posting that Gini! I had been looking for it. How beautiful, and it truly is a treasure! Thank you for sharing.